2015 was a big year for Nuru Kenya. In June, our whole expat team living in Kenya packed up our suitcases, said our goodbyes, and headed out of town. Our Kenyan colleagues had already been running operations for a year and were well prepared to continue in our absence. Yet, this was a big milestone for Nuru Kenya as expat exit had been part of the original vision since Nuru International Founder Jake Harriman and Nuru Kenya Chairman Philip Mohochi began mobilizing farmers across Kuria West, Kenya back in 2008. A lot has happened at Nuru Kenya since exit. 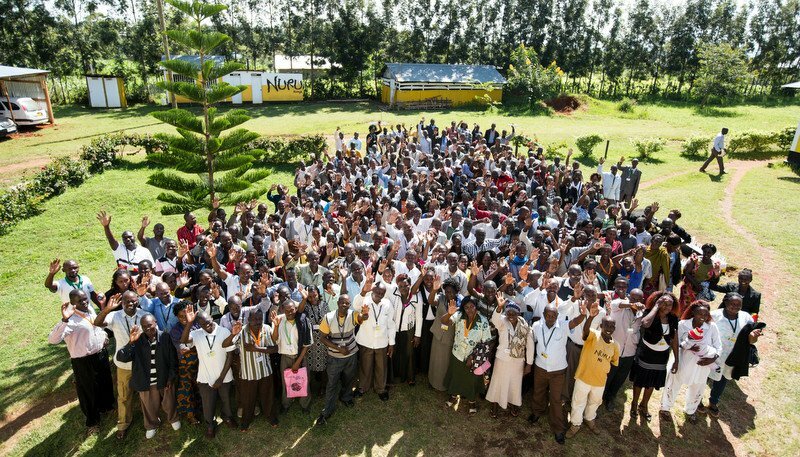 With Country Director Pauline Wambeti and her team at the helm, Nuru Kenya has successfully scaled programs to a new district, mobilized farmers into cooperatives, and implemented restructuring aimed at making operations more sustainable. The ability of the Kenyan team to implement new strategies while keeping operations running has been impressive and demonstrates the success of the expat exit. After taking some time to reflect on exit, our team identified the key strategies that contributed to this success. Over the last seven years, both Kenyan and U.S. expat teams went through different iterations of length of contract, compensation and required qualifications. In the beginning, Kenyan teams were recruited from a small, regional talent pool and expat staff rotated in and out quickly on six-month contracts. Expanding the Kenyan recruitment to a national level and bringing in expats who committed to at least two years in Kenya was an essential step toward exit. Once in the right teams were in place, Nuru International focused on building depth into the Nuru Kenya team through a deputy program. This program required high level Kenyan staff to select, mentor and train a deputy so that operations would not rely solely on a few key personnel. With four impact programs plus the Leadership Program and in-house M&E, on any given day there is a lot going on at Nuru Kenya. One way Nuru International made sure that all gaps were filled ahead of exit was phasing out expats in two stages. A year ahead of full expat exit, all four impact programs were consolidated under one expat staff member, the Impact Programs Specialist, while Leadership, M&E and the Team Leader stayed on board. Cutting the expat team from eight people down to four provided opportunities to stress test different programs to see where additional staff or training might be needed ahead of full expat exit. This consolidated expat team and phased approach also helped improve coordination and integration of operations resulting in tighter programming ahead of drawn down expat resources. Expat exit, like any major initiative, requires careful planning and concrete tracking of deliverables. From the co-creative Program Planning Process to the final stages of exit, Nuru International requires each of its country projects to meet key exit-related milestones at each stage. In Kenya, the formulation of milestones and design of tools to track toward them was initially a bit ad hoc in nature. However, Nuru Kenya developed great processes and tools which Nuru International will refine and use in future projects. These milestones keep progress toward exit on track, even in the midst of the complex challenges that inevitably occur over the lifecycle of a project. As Nuru International’s first ever country project, Nuru Kenya’s programs have been through many iterations and changes over the years. Over time, Nuru Kenya realized it needed to focus on creating impact programs that are able to create perpetual, self-sustaining impact. Essentially, the Kenyan staff must have a plan for handing over operations to community members and structures much in the same way that Nuru International has a plan to hand over a country project to a local team. Nuru Kenya is approaching this by mobilizing farmers into cooperatives that will be supported and strengthened in early years with the goal of creating self-sustaining cooperatives over time. Trainings and resources to make cooperatives sustainable from multiple perspectives – financial, leadership, environmental, etc. – are being designed and implemented as Nuru Kenya begins its first year of working with cooperatives in 2016. Exit can bring a lot of uncertainty and added stress if there is not a clear plan for post-exit communication and relationships. Nuru Kenya and Nuru International planned their interactions well in advance of exit. Both teams were given a chance to give input, ask questions, and prepare for post exit operations. This led to a fluid transition with no major interruptions to programming or confusion of roles. Currently, Nuru Kenya and Nuru International are continuing a close relationship where Nuru Kenya is the primary decision-maker with Nuru International consulting via phone, email, and biannual visits. Expat exit in Kenya was an exciting time for everyone at Nuru. The success extends beyond Nuru Kenya. By gaining expertise on how to set up locally-led projects, Nuru International is constructing an approach that is replicable across countries and organizations, thereby contributing to the development sector in an even greater way. This type of approach has the ability to fundamentally change the way development is executed, enrich lives and unlock the potential of millions of people living in poverty across the globe.